However, if you are anything like me, you may from time to time get overwhelmed or downright frustrated with all the contradictory nutrition information (or misinformation) that circulates like a thick cloud of smoke over our heads. Do you get exasperated with all of the information on the world-wide web on a particular nutrition topic? Or maybe you have thrown in the towel trying to feed your picky eater? Or perhaps you are debating whether to remove gluten from your diet? And then there is the ever-confusing debate as to whether eating a jar of coconut oil a day will solve all of your problems! These situations represent “food fights”. So many of us have physical boxing matches every day with either ourselves, our kids, or specific foods. It’s exhausting, life-draining and downright infuriating and takes all the joy out of eating. Part of my job as a dietitian is to coach people to calm these food fights, so I was pumped that the focus of Nutrition Month 2017 this year is “Take the Fight out of Food”. It pretty much sums up what I do every day. Identify the specific nutrition problem that needs to be solved, since it is causing a fight with food. Try to discern as best as possible the root cause of the problem. Blueprint Nutrition is happy to offer a free 15-minute consult over the phone or an e-mail exchange if you are uncertain as to whether we may be able to help you with your particular "food fight". Decide what needs to be done to solve the problem, using reliable and credible sources. I can’t say enough about reading reliable sources. Dietitians use a combination of scientific literature, as well as their own practice experience to inform their nutrition advice and decision-making. The same cannot be said for Joe-blow’s personal blog or even the online newspaper article that you read this morning. Put the plan into action with support from family, friends, a dietitian, and other members of the health care team. If you had a tooth with a cavity, would you try to fill your own cavity at home? I sure wouldn’t … not only does that totally gross me out but it doesn’t make sense. We visit a dentist when we need help with our teeth because they are the trained experts. It is my hope that one day everyone would acknowledge dietitians as the trained experts in nutrition and seek counsel from a registered dietitian when a “food fight” enters their lives. Over the month of March, I will post a few examples of these “food fights” and walk you through the facts and how to get the support you need. Commit to ending the fight with food by signing the pledge to take the fight out of food like I did! Visit www.nutritionmonth2017.ca to find recipes, local nutrition month event listings and more! 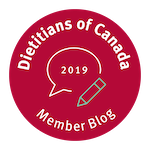 Did you know that Dietitians of Canada has led Nutrition Month Campaign for more than 30 years? This blog post was adapted from materials found on the DC Nutrition Month website.